Blogs - CC Zone: The Next Level - Chip's Challenge/Tile World website! There has always been this huge chip on my shoulder for many years, so I have decided to come clean about what truly happened during the time of CCLP1 voting to everyone. This is not easy and I don't expect people will forgive me, but it's going to explain why I have stayed away from the CC community for a very long time since CCLP1 was released. I don't know how many people outside of the CCLP1 staff know, but I felt enough time has passed to get it out. Back in 2013, during CCLP1 voting, I was the CCLP1 Voting Administrator, and J.B. Lewis was constantly monitoring who was voting what on each level. We all had a private Skype group chat together with the CCLP1 staff in it along with myself. At around the third month of voting, I got more and more frustrated with some of my own favourite levels doing badly in voting. I ended up developing a dark and nasty habit of being mean to the CCLP1 staff as a result, in particular having a huge grudge against J.B. Lewis (Me and J.B. clashed a lot even before voting began. At the time, I just got sick of the Chipsters seeing him as this perfect snowflake who thinks he is always right and nobody willing to challenge his opinions) who was mostly just telling me the progress of the votes. Shortly after, I started making a few CC Zone accounts and rigging it to favour my own levels. I ended up digging a huge inescapable hole in the long run and eventually rockdet figured it out for sure that I was up to no good. Not wanting to lie to rockdet on Skype who was my favourite Chipster at the time, I eventually confessed to the whole rigging. Rock didn't believe I was a bad person though, just someone who couldn't control his power. After that, the votes from the fake accounts were deleted and everything went back to normal. After CCLP1 was released in 2014, I lowered my time significantly on the CC community, eventually resigning my CC Zone Admin position in March 2015. So that's why my interest in Chip's Challenge has dropped significantly. CCLP1 was a very dark time in my life. Was I selfish? Sure, so that's why I chose not to submit any of my levels to CCLP4 voting. I didn't want to risk becoming that person again. On the upside, I found what my biggest weakness was so I decided to just let it all go and shorten my time with the community. A new era began and that was pretty much the end of Chip's Challenge for me. SET/RESET: The outer four buttons can be 'set' independently, and the middle button resets them all. 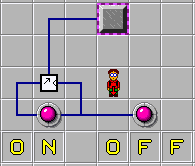 SEPARATE ON/OFF: A simpler version of SET/RESET. Basically like a toggle switch except the on and off functions are separated. MULTI-TOGGLE: You can add more branches as needed. Each press of the button moves the toggle to the next state. EDGE TRIGGERS: The STEP ON trigger fires a 1-tick pulse on tick t+1 after the button is pressed. The STEP OFF trigger fires a 1-tick pulse on tick t+3 after the button is released. The ROCKER fires either a 1-tick or 2-tick pulse on tick t+1 after the button is pressed, and another 1-tick or 2-tick pulse on tick t+1 after the button is released (the pulse will be 1-tick wide for a short press of the button, and 2-ticks wide for a long press). This is it, the final showdown with my thoughts. Wait, this is a thinly veiled FFX reference isn't it. HA HA HA HA HA okay this joke is overdone. One thing I find quite interesting to play is a field of blocks and water or bombs, and all you have to do is move around, building islands as you go. In particular, Plastic in the Ocean from UC5 directly inspired this- what if instead of having to bridge to the corners, you just had to pick up chips? Ultimately, it's quite easy- no Pentomino Lake without picking up the flippers, that's for sure. Unfortunately, splash delay does seriously hurt the level in Lynx... and I still need to finish CCLP4 in Lynx, right. Finally, the first level I designed for this set! The only goal I had was to throw back about a decade, with pointless rooms, diagonal walls, and pointless boosting! Unfortunately, the level still ends up being fairly modern in its design, but hey- it's a fun variety level with 12 completely separate rooms with absolutely no interaction between them, nope. Don't even try sending the fireballs and gliders into the bomb room, I definitely didn't plan that to be a useful strategy and it most certainly wasn't forced on an older version of the level. I think few levels show my usual design style more than this level. I built the central room first (symmetry, level branching off of one core interesting room) and then the fireball room to the right. The gliders followed (single block+monsters in varied forms, simple collision telegraphed) and the rest of the level followed in the order it gets played. I'm especially happy with the fireball stream trick to get the blue key, and the final tank shuffling puzzle. Unfortunately SOMEONE (Tyler) busted this level and didn't get the full experience... but Shane did because I fixed the level. My designer note for this level simply reads "Creative One Ways, Part 3?". I'm not sure how accurate that is, but when I tried resolving it well after I'd designed it I was quite confused, so I guess it does what I wanted it to. The highlight here is the fireball room and how it's completely impassible without a block. For this level, I used the walls of Wall Jumping Up Waterfalls to craft a non-linearly ordered variety level. The very first thing I tried to build in was a very lengthy final block path that would reuse most of the level, but this kept having to be scaled back and nerfed as there were ways around most of it. The initial release didn't require the block path it currently does as I had liked the shortcut, but after Tyler didn't even entertain the possibility of the intended path I took another look at the level and managed to require the oversized loop. In the final form, it's a fun level- I only wish the fireball manipulation was a little more clearly telegraphed in advance, as it's possible to fail right at the end. Walls from Communism. There are some weird hallway block loops to manipulate a single fireball through most of the level. It's not too interesting to play, but I'm still proud of the fact that I fit a completely different level inside Communism. Say hello to probably the only original concept in the entire set, because truly original concepts are hard to come by. Original executions, sure those are easy. But concepts? Have you ever seen a room where you had to keep a teeth from leaving a certain range, while also having to leave that range? The left room came first while experimenting with the concept of extending where you could step, and is rigid as a result. The right room followed as a "alright, now you understand it, now apply what you've learned" kind of room. It is possible to extract all 10 blocks, albeit not easily and it's not required in any case. Walls from Miika's Hexominoes. While I was skimming through custom sets for interesting arrangements of walls, that level jumped out at me. Sure, it was originally used for a collectathon, but there was some serious potential for reinvention there. Once I stripped the level bare... I had nothing. So I built the outside aesthetic, laid down a few objects to partition the level (most notably the tank guarding two red keys) and just built upwards from there. This is probably the longest level in the set despite only having a 496 time limit. Why 496? Because it's the third perfect number, after 6 and... 28. Naturally, I ensured that's how many chips there were. That sounds like something Miika would do. Obligatory blue wall maze with some shortcuts and I made the fireball puzzle first and kept that theming for rooms to open shortcuts. So, funny story about skimming through custom sets for interesting walls- Cyprus was a given. I immediately hit on the idea of limiting cloning to make a sardine can and then blockslide multiple blocks off of the same slide... but then actually executing the area took hours and was still broken for quite a while. Eventually though, I had a first puzzle and the tanks always changing (everything up to the fireball+tank room) and had no ideas for the remainder of the level, and it'd been sitting there for a while. Well, I had clone machines in place as partitions, but still. A month or so later Josh and I collabed and I sent him the half finished level. I got back the dodging sections and outer block part a day or so later- not what I would have gone with, but hey- it worked and was pretty fun! Though I noticed a few ways to squeeze out extra blocks from the end and made it required (touching the border is also required!) and telegraphed the gimmick of all blocks having gravel under them early, as it could be seen as unfair without that first block. Then I added my own block manipulation section to reach a hidden hint and called it a level. Time limit is 961 because apparently that's the area code of Lebanon. I hope you don't dislike invisible walls. Mission statement: difficult linear campaign level. The first section was meant to have a bit of tangential story to it of a prison, and also set the tone with an "In a Nutshell" style area. In hindsight, it's a little mean to start there and force redoing it every time the teeth+ball room goes awry. I went back and forth on whether that dodging and manipulation was fair, but ultimately decided that it was since you can see what needs doing in advance. That said, the tank button to start the manipulation was the last thing I added to make it a little easier. Then you have a fantastic blockslide puzzle before a really cool ball room and a few assorted puzzles before a fake-out exit. I wonder if anyone will ever die to that walker. Probably not, but the room is lol. Entered in the Movie Madness Create, which it won. Inspired entirely by chasing Snape down in Harry Potter and the Half Blood Prince, and the gameplay suits this. You see a green flash and something go off the tower, immobile, and then get to move when it dies, just like the story. Then you have around 20 seconds that demand perfection in Lynx and near perfection in MS, with some pinpoint dodging checkpoints and minor itemswapping. I love how carefully tuned this level is to work in both rulesets, something I couldn't manage with Extreme Hold Right Adventure. I do wonder if the design is too mean, though, as you do need to get a decent amount of boosts to even solve the level in MS.
Regrettably, I couldn't keep a section in which the glider would merge into a 3 tile gap of pink balls and clone another, blocking the path for Chip. Why? Slide delay- waiting at the upper force floors would allow the glider to delay, bounce off a ball instead of merging in resulting in its death, and Chip could just walk into the fake exit. I tinkered with a few potential fixes, but ultimately settled on just making the slide delay not matter. Fire and water have such a lovely aesthetic that I underuse. Open-ended cloning puzzles are such an interesting design that, again, are underused. Sooooo I made one with a semi-open order. 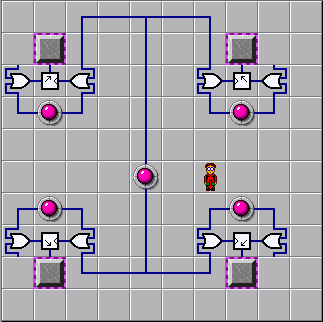 Gotta get to the bug on the right first to open the block cloner, then do the three chip challenges before the two socket challenges that subvert the normal flow. Shane picked up on the main trick pretty quickly, likely because I telegraphed it in advance. He also spotted a solution I didn't catch to the upper area, which I'm not unhappy with. Originally I wanted to force bridging around the bomb, but he found a clever way to use the existing blocks to guide a fireball over- nicely done! And finally, the walls from Archie's RUN OUT OF GAS in a spiritual sibling to Mental Marvel Monastery. Everything seen here is intended- I designed the level to have two solutions, and this one to feel busted. But nope- every little detail that juuuust works out is completely intended! That being said, I did not tune any of the monster order or timings for this route. I'm pleasantly surprised by how little waiting around there is here. The overall design goal was to make a level like Josh's Mental Marvel Monastery- a throwback medley, of sorts. Strengthening the connection, I used the walls from Archie's "RUN OUT OF GAS" as my starting point, as Josh used Andrew R.'s "Producing". I also took care to make each part try to feel like something out of CC1- I'm not sure I succeeded, but that's why there are the (few) random pointless bits and certain other design choices. Nuts and Bolts, Elementary, Tossed Salad, Oorto Geld, Scavenger Hunt, On the Rocks, Lemmings, Seeing Stars, Chipmine, Bounce City (skipped), Reverse Alley, Block Buster, Now You See It, Short Circuit, Torturechamber, Miss Direction, and Alphabet Soup. A level I made primarily for the "whaaaaaaaaat?" factor. It looks ridiculous at first glance, and then you realize the monsters are circling invisible walls and it's just a small maze. Even if I'd wanted to make it much bigger, I couldn't have, since you can only have 127 moving monsters in a level in MS mode, and the level currently contains 112. This is basically the obligatory walker level of the set, made at JB's request late in the set's production because I didn't have (m)any walkers levels yet. (I can't recall if I made this before or after Level 73.) That's about all there is to it. I definitely like the other walker level in the set more. There are plenty of monster-dodging levels where you can lure the monsters to their deaths, but not so many where you can send them away only temporarily...hence, this level! All the teleports in the play area are only enterable from the left or top to ensure that no Teeth will unexpectedly pop out of them at you, and the two Teeth trapped in the top-left corner of the level ensure that you can't use the teleports yourself to escape. This is one of my favorite levels from this decade. In an old version (released in the 33-level preview) I had an opening at (11, 13) instead of (10, 14), which caused Teeth to repeatedly move left along row 12 and drop into the spiral, meaning you'd have to lure them alllllll the way around again and again until the coast was clear. Ugh. I'm so glad I changed that for the 63-level preview and the final version. As far as the title goes, JB insisted that I use proper titling conventions and make the "By" lowercase, but I thought the title would stand out more if the "By" was capital, so I overruled him. I'm not sure where I originally heard the phrase, or if I just made it up. It is a book title and a card in a collectible card game, but I hadn't heard of either of them until I did a Google search just a few minutes ago. Another really silly "whaaaaaaaat?" level, and another way to use invisible walls without a ton of guesswork. There are monsters, but the maze is safe, so they must be held back by invisible walls...hence you can watch them to find your way through the maze! The name might have been inspired by the (very friendly and safe) "Incredibly Deadly Viper" from Book 2 of A Series of Unfortunate Events. Hmm, maybe I should have called this "The Incredibly Deadly Maze". A throwback to the four "Cell" levels from Po100T, but instead of force floors between each cell, the monster flows act as 1-way passages within some of the cells. The gliders and water in the top-right are just there to give the level a bit of visual variety. The center of the level could be though of as one big cell, but if you treat the socket and exit as walls, it's 4 cells arranged in a 2x2 pattern, which gives the level 36 cells as its level number would suggest. This was one of the very last levels I designed for this set, kind of as a hole-filler. The puzzles were designed mostly by playing with different configurations of tanks and toggle walls and seeing how they could be manipulated, and I'm pretty pleased with how the first couple turned out. However, I couldn't think of too many ways to make them more complicated, so I called it quits after a very easy 3rd puzzle and a 4th puzzle that's very similar to the first 2. The wall pattern has an interesting aesthetic, where I intentionally made the outer walls a mostly continuous path with no squares, crosses, or diagonal-only connections, and only a single "T"-shape. Also, unlike most levels, the title took me a little while to decide after I'd finished building it; in the end I went with simple alliteration. I knew some rooms would be harder than others, with the bottom-left and bottom-center probably being the hardest, which is why I let you visit the rooms in any order and skip up to 12 chips (just enough to skip those two rooms, or certain other combinations of rooms). It's possible the level is harder than I intended, even with the ability to skip chips. "Patterns" may not be all that popular, but it's one of my personal favorite levels from the set. I ended up liking the northeast enough to build Level 44, which is fully dedicated to the concept of avoiding monster "snakes" in mazes. First of all, let me say that I'm super happily surprised by how popular this level is! It was my highest-voted level in CCLP4. Anyway, my first idea was a reverse sokoban where all the trap buttons are initially held down and you need to UNcover all of them. But then I thought it would be more interesting if you had to do both parts--the covering and then the uncovering. The placement of the blocks and buttons was pretty much arbitrary. All I did was make sure there were no 2x2 squares of blocks (for obvious reasons) and no 2x2 squares of buttons (since then you'd be unable to move those blocks for Phase 2) and that I didn't surround all 8 squares next to the center thieves with the same type of tile (block or button). I ended up with this setup, tested it, and found it to be possible and moderately challenging, so I kept it. 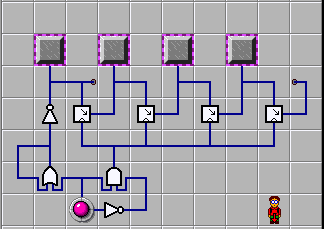 It was a little bit trickier to design the mechanism that would enforce the two phases of the puzzles. I was working on something involving a column of traps, a column of bombs, and spamming cloned fireballs horizontally after the first phase, but then realized that constantly-flipping-tanks and traps would be a simpler, more elegant solution. This level is based on the concept of force-floor-and-ice slides that take you from one section to another. It's named and inspired by a feature in Portal 2 shown in the video below. (It was originally intended to show up in test chambers, but in the final game only appears once, as a means of travel about midway through the game.) I like the block puzzle at the beginning, because it's the first instance I can think of where you have to get 2 blocks out of your way by "storing" them in a single space (fill in water, then pack down the dirt and put another block on that space). I think this is the best-placed of the secret hints. It plays off the CCLP3 trope of "don't pick up any items right away because you might need them to deflect monsters". I definitely didn't want to have this level be cooked if you picked up those chips because that would be pretty mean when the previous levels in this set don't require you to be so paranoid about taking items. However, the fact that you don't have to be paranoid to solve the level, but do in order to get the secret hint, makes the secret hint a lot less obvious than if you had to be paranoid to do both! Plus, once you do figure out the secret hint, it's nice that you don't have to redo the whole level...just enough to reach it. Normal file sizes in KB, as shown in Windows Explorer. File sizes inside .zip files in bytes, as shown in WinRAR. Hey remember that post? That was a few months ago. So what happened? Well...since I posted that, the only levels I played were in C1059-CC2, with the exception of that collab level I did with Josh, and maybe a few others. Either way, I did not play any other custom sets, nor any CCLP4 voting packs. And unfortunately, it feels good. CC is a good game, there's a reason why it's still popular over 25 years after it was first released. But honestly, now that I stopped playing, I can't say I miss it. I think that my life has actually been improving since then. Not playing CC anymore gives me more time to focus on things that I find more important. So essentially, I'm leaving CCZone. This time it's for real. It was good while it lasted, but now it's over. I released an update to C1059-CC2 yesterday; I reached my 149-level goal, nearly all levels have replays, and they shouldn't contain any major busts. If I ever update it again, it will take a while. Also, some of you may have noticed how I uploaded a bunch of videos on Youtube on Christmas Eve. These videos were filmed a while ago, I just didn't upload them. Now that everything I filmed has been uploaded, I won't be uploading anything else for a while. If anyone wants to continue my LPs where I left off, feel free to do so. Some of these are unsolvable, but I don't know which ones; you'll have to ask Tyler. 288 is unsolvable. 146 and 186 seem solvable but are extremely tedious. 156 and 251 are solvable in theory but require extreme luck. I don't know about the others. Levels 1 to 38 have been solved, except 23 and 24. 23 is unsolvable, I don't know about 24. I may visit this site again sometimes, but don't count on much. I may come back for CCLP4, but I won't guarantee anything. If anyone needs to contact me, please email me: myusername at gmail dot com (of course, replace myusername with my username). I have one last request. Please consider C1059-CCLP4 for all future official CC1 sets, and C1059-CC2 for all future CC2 sets. Tyler will have to give his consent for 110 to be submitted, and Josh, for level 147. I don't have anything else to say, so just goodbye. Thank you for being a part of my life for the past three years or so. Be positive and amazing. Well where the heck have I been? Has the buzz worn off yet? Just finished voting on CCLP4. And by "finished" I mean finished with the first round. I intend to go back and update. 1. I don't have to finish a level to rate it. This explains why I finished first. Finishing levels can be very time consuming. If I can't figure out what the level is about in a few tries, I mark it with 3s and move on. 2. Any level I've played before may not get played at all before voting. I probably already know how I feel about it. 3. A level ending in ing is scored with great skepticism. If you don't know why...lucky you. 4. I didn't rate all of my own levels a 5...wait, maybe I did. I took care to submit only levels I personally thought were very fun this time around. Given enough time, I'll go back and perhaps update my votes, but they are good enough if I don't. After being away from the game for over two years, I got interested in playing and designing Chips games once again. At first I just wanted to chose one of my favorite levels - "Road to Chip's Heaven" and totally rebuild it - which I have now done- called BRIDGES.. I started looking around the site to catch up on what has been going on. I realized that I had forgotten so much that I needed to email a few of my Chipster friends to relearn a few things, etc. Josh Lee was the only one that I was able to contact for help, which he has gracious been doing. When I was looking around the site, I read Miika's blog and noticed that Miika had also recently returned after being away for while. While reading Miika's blog, I saw a man that plays the game with integrity, not looking at an editor to see what to do. (I can't say that I do that) He likes to have the time to figure things out on his own. That is why I made the BRIDGES levelset. The two levels are just about the same except for the North West corners. The first level has no time limit to give the opportunity to figure out the level without running out of time. For those that like to approach the game like Miika, I had the idea that once the player knows the scheme of the layout, the player can then move on to play the second level to see how well it can be plaid - time wise. Also, the second level has a stealthy shortcut, which could be fun to discover. Due to Miika's approach to the game, and him coming back at about the same time as myself, I want to dedicate my first levelset to Miika. I have called it "BRIDGES" and have upload it. Note: Since I first made this blog (the first time), I discovered a mistake that I had made in my first upload, as I had added some block in the South East corner to make it look more symmetrical (that was a mistake) because I should have checked the level out before uploading the set. Well, since I had to fix that, I have made other improvements as well. plus redesigning the North West corner area. I left the North West corner in the second level the same as it was in the first upload. So, there are two version of that area. The first level's is probably a little more difficult. I apologize to those player that have already downloaded the mini level-set. I promise to do much better about checking things out. I am confident that BRIDGES is right now. ...which you might have known if you've been paying attention. I had a good clean break of one year from this game, and now I plan on hanging around for a bit again. It's nice to be back. I see most of you are still here and even some new people have joined the mix. That's great! If our community wants to survive for another decade, we need new blood. Do hang around for a year or two, and maybe a couple of you will stay for longer. And for those that feel they've had a good time but need to move onto other things, do take a minute and say good bye. You'll always be welcome back! Last year I got a new job and moved to another country. It was good to have a break from CC. Things have settled down a bit now, and it's good to not be away anymore. However, I'm going to try to manage my time and efforts better than I have in the past. There are simply so many interesting things to do in the CCverse that I will need some focus to get anything done without having it overwhelm my life. Mainly this means I won't be optimizing the official sets as much as I'd like but will rather try to chat and create content here. It's very likely you'll still see an occasional score report from me, and in particular working together with other people on problematic levels is something I'll gladly be doing. I was going to list some of my goals and plans for the coming year, but now I feel like any such list would be lacking as I haven't yet totally caught up with everything in my mind. I did read my previous blog post and was happy to see I did most of the things I was hoping to do last spring. I would like to post on this blog about once a month if I can find the time. I would like to finish CC2; so far I have played half the levels. Of course I also need to sort out my scores and totals on the official sets, even without any improvements. I'll definitely be running some competitions and judging them, even though those always take up a good chunk of my available time. I haven't decided on what I will do with CCLP4 voting, but at least I'll keep an eye open. (To clarify, I don't know if I will vote on all the levels this time.) Finally, I have a ridiculously long back-log of semi-interesting semi-important projects that I'll try to wade through every once in a while. Thanks for having me back. Let's have a great time again! This about the CC2 game engine compared to CC1. Not the levels or game elements. First of all, years ago; When I was first forced to start using tileworld [because MS chips challenge doesn’t work on 64 bit Operating systems] I used the MS rule set. That’s what I was used to and I liked it better. Lynx seemed very weird at first and I didn’t really like how a few amount of seemingly simple rule set changes really made for some major changes in level design. After a while however I got used to Lynx and grew to like it better. Now, I pretty much prefer it and I can’t really stand MS anymore. The main reasons; smooth animations not only look nicer, they make it much easier to play, to see where monsters are going and easier to follow chip around as well. Now whenever I play MS it feels so choppy and annoying. Secondly the glitches in MS are a pretty big hassle. Most notably slide delay and the controller/boss glitch. So it’s really nice to not have to deal with that. But now that CC2 has been released I must say that I like that so much better than either MS or tileworld’s Lynx. Not only because the game and the new features are awesome, but I like the game engine better. I feel like movements are slightly smoother and more fluid. It also feels like the hit-detection on enemies is friendlier than Lynx. So often when playing in tileworld I die while trying to step into a line of enemies or get caught by a monster when I wasn’t expecting it. I often misstep, either moving too far or not enough. 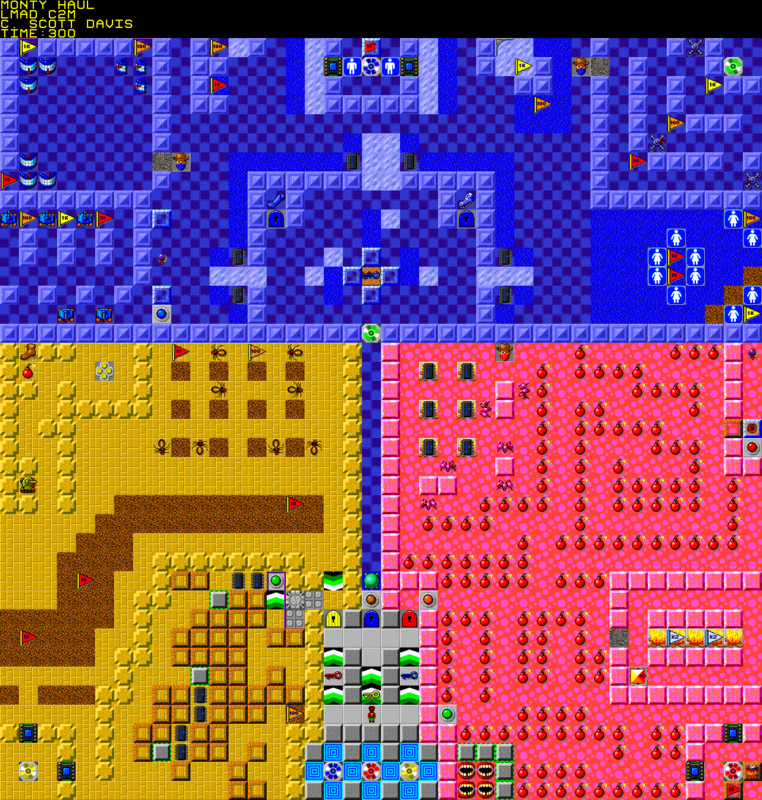 If I’m really honest my playing experience with Tileworld’s lynx has been quite frustrating. CC2 has its share of glitches too of course; some of which while I haven’t run into yet myself, I would image may be quite frustrating. But so far, nothing I’ve encountered has been as game-breaking as the MS glitches. Overall I really feel the improvements on CC2 far outweigh any negatives verses CC1. So for the most part I’ve stopped playing CC1, though I still play a level or two occasionally, I haven’t deleted the game forever or anything like that. But from now on it’s primarily CC2 for me. And any level sets I make will be for CC2. What other people’s thoughts on this? *this is a side point but that splash delay is weird imo. I recently saw a video of the Amiga version of chips challenge [which in graphical quality looks very similar to the Lynx] there is no splash delay at all! Hi, I guess I'm momentarily back. 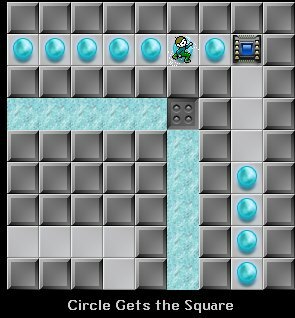 Recently I was hungry for a new puzzle game and decided to play through CCLP1. I was heavily active in the months before CCLP1, but burnt out too early to really play through it. I beat about 25 levels when the set was released, but quickly lost motivation and quit CC. So this was, for the most part, blind. I played the game on tile world lynx (as opposed to the awful, buggy and somehow popular 5fps port) and beat all but one level in 4 days. This isn't my return to the community, I simply felt like playing CC recently. I feel like I have somewhat of an outsiders perspective and haven't really been influenced by the hype. The set starts of exactly as you'd expect. However, after the well-picked lesson levels, CCLP1 presents a medley of about 80 levels which were all designed for the level 15 slot. No individual level was actually bad, however by level 100 I noticed that the set I was playing through hadn't reached Tossed Salad difficulty yet. Am I really not trusted to figure out how to dodge the enemies 2 seconds into Starry Night, or experiment on puzzles? I remembered back to the strategic dodging on Digger and Blobdance; the creative puzzles Four Square and Catacombs; and Blobdance and On The Rocks, which dared to be difficult. Due to an excessive focus on beginner-friendliness and "fair" design (can it be beaten it in 1 try), CCLP1 is simply boring. This is not a replacement for CC1. I understand that this game was targeted at beginners, not me, so please don't get too offended by anything I say. I know I'm being harsh. But this is just how I personally felt about the set. After the early-game snoozefest, however, the set becomes a lot better, and I enjoyed most of the triple digit levels. If only the set had reached this point sooner, and I see no reason why it didn't, I would've really like it overall. Thief, You've Taken All That Was Me was hands down my favourite level in the set. I guess that shows what kind of a game I was hoping for. Will I come back for CCLP4? Perhaps. Right now I'm even entertaining the idea of LPing it, but who knows how many times I'll change my mind in the decade before it gets released. One thing's for sure: if I ever play that Chips Challenge set, it's because I want a challenge. Something with a difficulty peak that puts CCLP3 to shame. But that seems unlikely, since certain members of the community will denounce anything that takes them more than one attempt to beat. At the very least, I want that feeling of being stumped by a puzzle. And that feeling of solving it after so much time and thought. I only weakly felt that twice in the four days it took me to finish this set. CCLXP2. I recently finished playing through this set and to say the least, it was a different experience than back when I let's played the MS version. Not by much, but different enough to call it out. The CCLXP2 project dates back to as early as late 2011. As we all know, CCLP2 was not crafted with the lynx ruleset in mind, due to the fact people were far more aware of the MS port instead of the original version. Over the years and especially after CCLP3's release, Lynx compatibly became more common of a ruleset, with many more designers crafting levels with both MS and Lynx rulesets in mind, instead of just the former. Because of this, various community members, including myself, took it upon themselves to make CCLP2, Lynx-compatible. For players who prefer the Lynx ruleset over the other to enjoy the first offical level pack (at the time at least). I was once part of this project in its early days, since I am a big fan of CCLP2. But as time went on and going through many hiatus periods, eventually I disbanded from it due to other reasons. Despite the fact it has been released for quite some time now, I finally found myself to take the time to play through it. I was very tempted to LP this, to go along with my old out-of-date MS run back in 2011 but I decided against it. As far as feedback goes, I will leave some for any level I found particularly interesting or more of a challenge. This includes the fixed levels and even some where the gameplay was slightly different but was still Lynx-compatible from the start. This was the first level in CCLP2 to use invalid tiles. Originally, every collectable item was under a fake blue wall and the path to the exit included an ice corner, which can't be passed through in Lynx. The fix to this was shifting all items to the upper layer and over some to require close to the same amount of time to obtain as it would in MS. While the level itself wasn't really interesting even in the original, I found it enjoyable to finally play it in Lynx. I always choke myself up whenever I go back to watch Rock's run of this level and dying hilariously. This level went under very little fixes actually. Aside from the monsters not being on top of blocks, the way to collect chips was interesting. This was possibly the best (and only) fix for this and it was much appreciated. Got the bold on my first try too, without trying! The fix to this was simply making it possible to move at the start. Originally, the glider would kill you instantly in Lynx. Not that this mattered because the level was unplayable anyway due to the thin walls being under some fake blue walls and normal walls under chips. I found it a little amusing that the pop-up walls in the fixed version aren't necessary. I never was a big fan of this level but the fix to it was pretty simple. I like the new mechanism that replaced the original buried pop-up walls under the red locks at the start. This level was always silly to me, but this version is very obviously different. Such that the fire was replaced by water and most the monsters were swapped with their counterparts. Still was simple as ever to solve though. I hated the original version but this one did it some justice, though not that much. I remember looking at this level upon this project's early days, figuring out what could be done if the wrong red buttons were pressed. That fix was clever, I never thought of it. The fact the blue keys next to the tanks were still there when viewing in the editor was nice to see, though me personally I would have swapped through some keys as to not add some like the lower right did. Finally, the way to exit. Great change. I disliked the original with traps under locks. Even though I didn't trapped in this run, had I done so I wouldn't have minded as much. I remember this change being brought up and it is indeed a great one. Does not affect MS's solution at all, which was part of the goal whenever possible. Surprisingly, I had a hard time at this one. I was so used to the way monsters moved in MS that it's completely different in Lynx. The glider section below was also a challenge to go through since splash delay is a thing. Overall, I enjoyed it but I probably won't replay it ever. So this was the first level that had to undergo a big change. While it's appearance is quite similar compared to viewing the original, the gameplay is slightly different. Blocks moving against each other while on traps is actually a pretty clever concept and I liked it. I did get killed by the first attempt though, since I didn't pay attention to the display message before. While this level was already compatible with Lynx to begin with, I felt the gameplay was different enough to review it - notably, the glider part at the start. For the longest time, I kept thinking it was possible to go through it the same way in MS but I don't believe it is. Until I realized the flippers can be used to collect those chips. Even though it's possible to do that in MS as well, I never noticed that and I really liked that it was used here. I really found it fun that I was able to obtain all the first chips in the east fireball room without stopping. A lot of levels in this ruleset do this and I found it nice. The only other difference I found cool was the blobs on ice. The timing to get past them a few times was a good challenge. 48. And Then There Were... Four? Of course those fire boots are still in the third column. I liked this fix, I remember it being brought up and it was well-received. Though, I don't think all the other red buttons needed to be there. The beginning was much more difficult, since you have no control over the random force floors. I honestly really dislked the paramecium part after this. I felt it could have had more wiggle room and less of a chance of dying by it. Other than that, this level was pretty good. I just realized both Madness levels changed in this set. Anyway, the only changes were the hidden items and the force floors underwater right at the beginning. Mostly everything else is the same. It was a good level to play again. One of the few levels that I actually suggested the fix for (The other being Frost Swirl)! And a different style gameplay, since I couldn't rely on boosting like I could in the original. The bomb section at the bottom was a well done fix. It was appreciated that I could actually kill off some of the gliders, if I really needed to. It was sad to see the original level's concept go but there was no way to replicate it for Lynx. So arguably this one was a lot, lot easier to solve. An actual level that requires you to erase blue keys? This may be my favorite level in this Lynx version. It was just a ton of fun to play and has so much replay value. I loved it, well done to whoever's idea this was! The blob section was a lot more challenging here, since blobs act weird in Lynx. The force floors at the end gave me a headache. That's mostly the animations fault but still it was a pain collecting the chips there. Was still fun to play again regardless. Okay. This level wasn't nearly as evil as the original. I actually kind of liked it? That's kind of hard to say though! Thankfully I didn't die by any ball on that ice slide, though I did almost get killed by the block containing suction boots in the NE. A good fix to the level but I didn't enjoy playing it. I found it easier to mess up guiding blocks in this version. I might have been impatient though. I remember there being debate on whether this level should stay or be replaced by a mirrored version that I made back when this project was first starting out. I'm honestly a little disappointed the mirrored version didn't get used here, it would have been much easier in my opinion. Anyway I had to watch Miika's lynx solution to this level to solve this. I especially hated the ending that requires nearly perfect timing to exit or you'd get killed by a glider, which is completely out of your control. I wish some were removed at least but oh well. In general I can't say I liked it, but it was definitely a challenging level. Lol I accidentally erased the blue key on the first attempt. Backtracking to get the green key before pushing the block was not fun. It couldn't be helped though. What could have been helped though was the teleport/splash delay cook at the very very end. That wasn't very nice, Lynx. Still remained just as fun as the original, despite the change. It was a little harder to outrace the glider before getting stuck. I recommended a time limit increment for this level but unfortunately it didn't receive one. So the bold time is 2, which I find funny. Block slapping made this level a lot easier. Even though its not required here, I love the fact the force floor remains in that once called "Ram" section. Nice touch. This is the true definition of a lame sequel. And the walkers didn't do it any better. Did not enjoy this one. I never did play the version that required odd step but this was a good level. I appreciate the teeth in NE no longer releases out of it's trap. No changes but because slide delay does not exist in Lynx, this level played sooooo much smoother. Loved it. I raged on this level in my MS run. I despised the original so much, it's my top least favorite CC level. BUT. This version did it so much justice. I loved it. Considering to replace my #1 least favorite level now. I'm surprised this was mirrored and Glider and Fire wasn't. But it makes sense with this level, since the original had fire all over the place. The level was great. I don't know if it's the same gameplay just mirrored but it seemed harder to me. Great fix (or replacement I guess?). This one wasn't as annoying as the original. Quicker to solve as well! I'm surprised the AVI for this level claims this to be unsolvable in Lynx. It was definitely more interesting here though, it had me stomped on how to exit since the way to in MS couldn't be done. I found this to be a little more timing based. Enjoyable to play though was never much of a fan of the original. Moving with random force floors everywhere was more difficult than it should have been. But still fun to play! The fact there still resides a bust here makes this level better. Didn't catch it until I completed it the first time, so I went back and executed that bust. I don't know if it's possible to collect all 15 chips in the teeth corridor, but I didn't chance it. Thankfully the 2 at the end were useful for something! The walker clone machines also acted out with me and caused me to die several times. Hated the original. Hated this version even more. I especially hated that a fireball in the west room goes in the ball/chip room which only made it unnecessarily harder. Sorry. Just because gliders don't die in fire here, I went all out with the cloner and spammed it for a good 30 in-game seconds. Don't do that, it ain't a good idea. Anyway I had to watch chipster1059's video of solving this in Lynx because I was at a complete loss on some parts. While I'm pretty sure it's possible otherwise, I relied on collisions to collect the yellow key and one of the chips. I hated one collision but loved the other. Thanks chipster for the video assistance! Liked the fact the traps made getting blocks in those spots for gliders to destroy the bombs much easier. I didn't enjoy this level that much unfortunately. Overall, playing this was very interesting and most, if not all, the fixes were excellent. Thank you to those who worked hard on completing this project and I apologize for disbanding in the middle of it. You did CCLP2 some justice with this. I highly recommend playing this, even if you weren't a fan of the original. There’s quite a decent difficulty curve and plenty of variety to satisfy players of many tastes, with many levels of different sizes and gameplay styles. If you’ve played Chuck’s Challenge, it’s worth noting that quite a few of its levels were based on CC2 compositions. There are at least three levels that reference CC1 in some way. There are also plenty of level titles that would later be used again in custom and official CC1 sets. A few level titles: CHAMBER BOMB, SMUGGLER, PATTERN BUFFERS, IN THE SLIME, SAUCE FOR THE GOOSE, CHAOSLANDS, IDENTITY CRISIS. No worries - there aren’t any levels that are quite as long as ON THE ROCKS or PAIN here! One level is an early version of a level that would later appear in CCLP3. Speaking of CCLP3, some of the late game arguably approaches its difficulty, at least in the early triple-digit range. You can place doppelganger versions of yourself or Melinda on the map to do your bidding (defined by a red, opaque background), but you can also place multiple copies of yourself or Melinda as well. In the latter case, you’ll have to get everyone to the exit, making for some interesting puzzles that involve switching between characters. Want all the collectible bonus flags in the game? You may have to wait a while. The levels were designed before the turn of the century, so if you’re familiar with the level design techniques commonly used back then or in CCLP2, you know what to expect here. 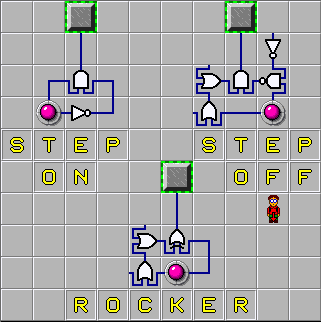 Before it was ever used in “Chance Time!” or anywhere else, the “choose your own adventure” level layout was first introduced in CC2, as shown in the level pictured below. There’s a level with 207 teeth. Get ready for a lot of strictly timed levels. Using other items or enemies to pick up and drop items will really mess with your head. There’s a level with 900 chips, and yes, they’re all required. The yellow teleports truly are a precursor to Portal. Not only do you have to think about where to place them, but in some cases, you have to place them in such a way that you can later partial post and pick them up for subsequent uses. can we burn something today? I've already told you about my first impressions of Lesson 1: sort of dull. But obviously I was intrigued enough to continue. Lesson 3 seemed so advanced compared to the first two levels. Actually, I never thought of the Lesson levels as tutorials but they were real levels to me. I don't know when I learnt that there was a difference between Ice and FF's, but it wasn't from this level. In this level, they work pretty similarly. I must soon have noticed that the ice goes both ways and FF's only in their direction, but there was really an 'aha'-moment when I learnt that FF's can be overriden while ice cannot. Lesson 5 - now this was long my favourite level! Well, maybe not soooo long time but until I advanced to more challenging levels. I really didn't understand what the bear traps were or what they did, but I just tried stepping on the buttons which of course worked, after all, it is a lesson level. And I was so proud when figuring out on my own how to stop the fire balls from cloning! I played this level again and again and tried to improve my time. Lesson 6 was boring. They could have made more of that level. No need to have a whole level just to explain the invisible and fake walls. Plus, I only went to the left side so never had to encounter the appearing walls. Lesson 7. Well, I certainly didn't learn from this level where the teleports take you. It was only some ten years later when I started designing levels that I learnt about the reverse reading order and all that, back then I thought that the designer designated a destination for them. Of course, I stepped on the thief carrying both boots, who didn't make that mistake? So that was a good lesson. Lesson 8 - I actually beat this level at first try and was very proud of it. My friend must have explained to me, or if I read it in the help file, how the frogs move. Finally, Nuts and Bolts! I ctually think the FF section was the hardest to execute. I remember cooking the block section a couple of times, and of course dying a few times later on, and so having to play the FF section many times. Oh, the ice section. I could do that in my sleep. When playing this level after several years of playing only other levels, it's still there in the muscle memory. RDLULDRULD2RDLULU. You should try it. Next section - a bit cheeky that you close the first door if you don't step on the button twice. Also, the very first time I got this far, I was of course killed by the fire ball on the ice. I love sokobans so the bomb section was my favourite, and I remember being stumped for a while in the very last room with the beartrap and fireball. Now, I've been writing for too long. It's teatime and then bedtime. Over and out. Alright, so, I know it's been nearly eleven months since I posted the first and *only* entry in my blog. That was probably for the blog award, right? Yeah, sort of. I never really had anything to write about other than CC1 experiences when I was younger, and that's the first thing that came to my mind when I wrote that first entry last March. So, I said I would continue this blog, so... I'm gonna continue it all these months later! So, what's there to write about? One of my favorite things that I remember from playing the original Chip's Challenge in MSCC on a Windows 98 OS was probably.. well, the levels I admired the most. I never had a level editor at that time, as I didn't even know they existed and thought that the 149 levels at my disposal (in which I accidentally discovered the ctrl+k shortcut, and that's how I had access to all the levels..) were the only ones ever made for that game.. I was wrong! At this time, CCLP2 had been out for a good four and something years, and I never found out about it until around the time of CCLP3's release. Wow, I sure did miss a lot when I lost access to CC for a good 3 to 4 years, between 2007 and 2010-2011. My favorite two levels in CC1 at that time were probably ALL FULL and ICEHOUSE. ICEHOUSE is definitely on that list, as I dedicated some of my time to drawing maps of the ice corner ring structure that the majority of that level is made of. I liked racing and racing-type video games when I played CC back then, and ICEHOUSE was a great way to implement the fun of racing with the monsters sliding around in the circular pattern on Icehouse. I had a lot of fun on that level. ALL FULL was namely for design, as that's why I enjoyed it the most. I loved the upper section that was full of chips - when looted, I felt like I had accomplished something by gathering all of those collectible chips. The force floor ring and fire section in the southeast was also a signature location in that level for me, as it attracted my attention as I experimented with it from time to time. All in all, it was just a fun, nice-looking enjoyable and comfortable level that I could play almost endlessly (before going back to Icehouse) without ever knowing that the C/B glitch had any effect.. I didn't know what it was, of course. Honorable mentions must go to UP THE BLOCK, as it puzzled me as to how to get the gliders exactly down in the bombs - of course I knew how, but at first I couldn't grasp the concept. Once I got to the lower sections, the open areas felt like a nice touch as I could practically free-roam through the two or three rooms that those areas provide. The level itself when I play it or think about it instantly makes me feel some nostalgia, although not as much as I used to experience. I definitely felt the same way about FOUR PLEX, as it was probably my third or fourth favorite level in the set. I loved the aesthetics of the water and fire in some areas, and it presented a nice challenge (the glider room, specifically). Overall, I love the design of the level and hopefully I can revisit it one day whether it be in the CC1 level or a recreation that I might make of it that the original level itself inspired me to make. Overall, both of these levels deserve the mention and are for sure in my top 5 CC1 levels, if I have a list.. of top 5 CC1 levels. Other than that, there are definitely a few more experiences from the past that I could dream up and remember, but for now, that's all I mainly wanted to get out of my head and express. Hopefully it doesn't take me another ten to eleven months to post another blog entry, but I don't know. Hopefully my CC interest rises as it's been in a state of decline lately as I've had a large lack of level ideas for my second ZK3 levelset. Anyways, that's all for now. Stay tuned for (hopefully) another entry in three or so years! Why am I in CCLP1 staff? After yesterday's stream of Giraffe set, discussing with other players and reading your thoughts on what I've already played, I feel that I have to write this. I've pointed out issues in the stream itself, but with 3 watchers, I was not expecting a miracle, also given the fact that they're in the CCLP1 staff so they probably already have some form of consciousness about the whole thing as well. So, liking a level doesn't mean it fits in the mould, and disliking it doesn't mean it doesn't. Before going ape about a level (because you don't like the type or you haven't gotten the gimmick), you might want to stop and understand its purpose, and analyse what it could bring to CCLP1. I've seen way too much negative things about pearls, just because it doesn't suit one's particular taste. Also, dying in a level shouldn't make the rating go down. Dying has to be expected, and who wouldn't die while playing the original 149? I dare say no one. So we could probably do with a little more thinking and a little less selfishness, perhaps, maybe, question mark? As part of the staff, I'm going to tell you right now that our first priority in building this set will always be variety. Again, we're making a community pack. As veterans, we probably all hate playing a long and basic maze. But truth is, we still need some of those. Why? Try playing 100 itemswappers in a row, and as you blaze through, just realize how your mood would wear off. Yeah, exactly, the magic slowly dies and the whole thing gets heavier and heavier. This is why we certainly don't want to go "this-level-is-the-best-let's-have-149-copies-of-it-into-the-product". But wait, more than that : we have some of those mazes in the voting, and they're pretty darn gosh good! So why voting them down just because we don't like playing them?! That feels so selfish to me... What I like to do when playing a level is comparing it to the best levels I know of this particular type. If it's a dodging level (and you know I love them dodging levels), I'll ask myself if it's the best we could do for CCLP1 in terms of dodging. Same goes with every other type. Sleeping Dragon : Amazing concept, I haven't seen enough levels where you have to drain the exit path. The only thing I had against that one is the partial post trick involving the blocks, which makes me place that in late game situation. Cross Over : A very creative maze, not much else to say. Very well crafted. A (Mostly) Simple Maze : When I finished this, I stopped and thought "what did I just play?!" We need something like that in the early game, and I love the fact that you can solve it 358 different ways. Finding : It felt like one of those Hidden Danger ones, where you just keep on rambling everywhere not exactly understanding what's going on and eventually find yourself collecting everything. Pretty great. Blobs on a Plane : Was it to be expected from rockdet or anything?! Despite dying quite a lot when I played it (which isn't a bad thing), it was exciting and deserves a spot in the major league for me. Courtyard : I never praised this level enough, everything about it screams win. Balls. : This level reminded me of Four Square, it really made me smile a lot. Secret Passages : An amazing level, a maze without feeling like a maze. I'd be clearer with the chip hint thing, but nonetheless a fantastic composition. This is rockdet signing out, keep up the good voting job folks!